You are currently browsing the tag archive for the ‘Exhibit’ tag. For the next few months I will be focusing on artifacts that are on display in our current exhibition “Quilts and Coverlets: Piecing Stories Together”. This month we will be looking at the Loom. This working two-harness counter balance loom’s main purpose today is to make rugs. 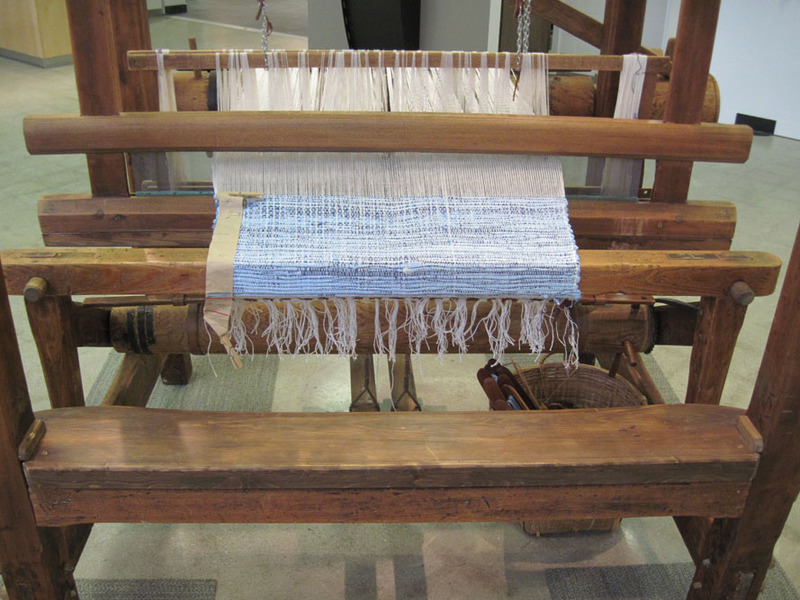 It is also called a barn loom and it is the tradition type of large floor loom used around the world. 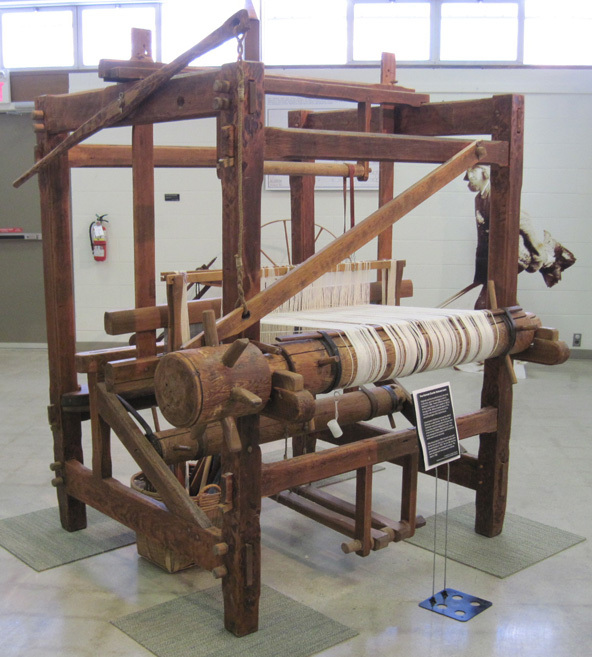 The history of this loom has passed down through 5 generations and a short summary is below. It was originally built for Amerilla Graves, possibly by one of her brothers, shortly after she married John C. Robinson in 1856. The loom had four harnesses at that time, and was used to weave homespun fabric for clothing and blankets. It was used in their home located at Lot 14, Concession 7 Caradoc Twp. Twelve children were born to the couple before John’s death in 1884 at the age of 48. Before Amerilla died in 1913, the loom was moved to the home of her second youngest child, Maud Hunter. In 1900 Maud married Eli Hunter, a dairy farmer, and lived on Victoria St. in Strathroy. By this time, two harnesses were removed from the loom and it was only used for making floor mats. Two of the Hunter children, Roy and Lucy, wove mats alongside their parents, and hundreds of yards were woven and sold. After Maud died in 1929, the loom was used by her second child, Lucy, who married John Everett Hambly in 1927. The loom was moved to Lucy’s home on English Street in 1934. Lucy’s son Bill and two grandchildren, also learned to weave on the loom. It remained in Lucy’s possession until she died in 1980. It was donated to the museum in 1980 by Lucy’s grandchildren and restored in 1998 by Hans von der Recke of Katesville Woodcraft. Over the last few weeks museum staff have been hard at work with events and exhibit preparation. The Collections Storage Facility was highlighted on Doors Open Middlesex on September 17-18. We had over 100 people come out and view the storage building. If you didn’t get a chance to come out that weekend and still want to see what the Storage Facility looks like you can call 519-245-0492 and make an appointment and staff will be happy to answer any of your questions. Also the second installment of the ABC’s of the collection will be starting shortly, so check back often to see what items will be highlighted next. Hi it’s me again, Michelle. I am enjoying my time here at the museum. 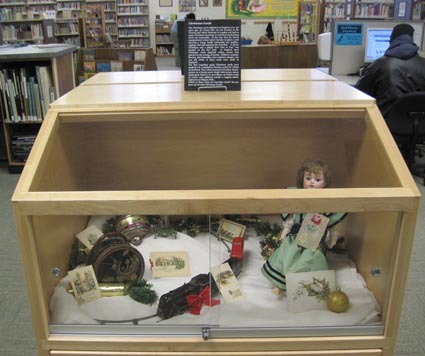 I recently had the opportunity to design and set up a Christmas exhibit in the library. I had to select each item and design a layout for them in the 2 cases I had available. I included some of the more common toys that one would see in a 1900’s home in Strathroy. I chose some neat old toys like a doll, building blocks, toy trucks and cars, trains, spinning tops, toy horses, and an elephant on a platform. These all stood out to me as toys children would want to see under the tree on Christmas morning. Plus they were all really cute and I really never get to see old toys like that up close them. I also included Christmas cards, it was interesting to learn about the history and it was amusing to see the difference between the cards made in England and ones made in Canada. The imagery is quite contrasting.. 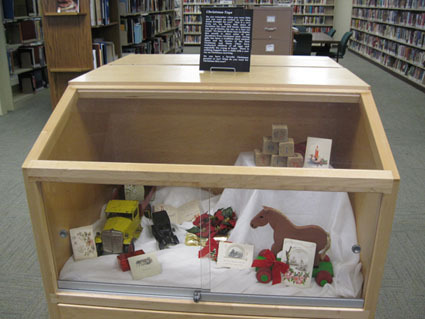 I also had a lot of fun decorating the exhibit cases with Christmas decorations and white sheets. I am glad I had this opportunity to be creative and design an exhibit on my own.